This is the first stage of extreme floor restoration. It is required to deal with the most extreme faults in terms of lippage and deep scratch removal. 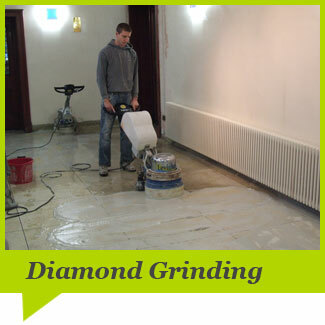 With the diamond grinding technique we use very heavy wet floor grinders with metal bond diamond abrasives as part of a nine stage programme. 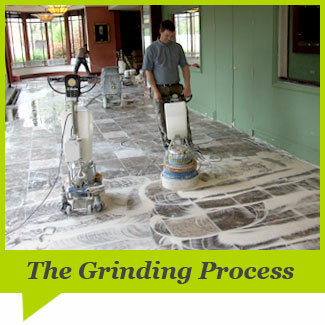 This process is only suitable for marble and other natural stone floor as it effectively removes the top layer from the surface leaving a honed finish. At this juncture the client may opt for a polished or honed finish which will determine the number of stages in the process to achieve the desired effect. This is the best and truest form of natural stone restoration as it leaves the floor ready for diamond polishing in order to achieve a factory finish, free from all marks, scratches and lippage. As mentioned it may be left with a beautifully honed finish or a highly polished finish, and with final sealing it will be ready for long term use. This process is highly skilled and time consuming operation which should only be attempted by experienced and highly trained operatives.